How to get the easy-to-use Windows 7 Style Start Menu back! - JB Computer Services, Inc.
How to get the easy-to-use Windows 7 Style Start Menu back! One of the biggest complaints I hear about Windows 8, Windows 8.1 and Windows 10 is how Microsoft updated and changed the Windows Start Menu. People find themselves frustrated when trying to find their documents, pictures, printers, control panel, etc. Even shutting down or restarting the PC is dramatically different from the way Windows 7 and XP operated. Here’s great news: You can download and install a free program from CLASSICSHELL.NET that will switch your Windows Start Menu back to the classic style used in Windows 7 and Windows XP. The program is very easy to install. Run the file after it has finished downloading. The installation is simple. Click “Next”, agree to the license agreement and click “Next” again. A ReadMe document will appear after the installation is complete. Close or minimize the document. Don’t change any of the settings on this page. Only click the OK button to continue. If you select any of the replacement start button icons, you will be stuck with an unusual looking start button forever. At this point you should be finished. Follow any other prompts that may remain. Click on your Windows Start Button to view the new Windows 7 style start menu you just installed. 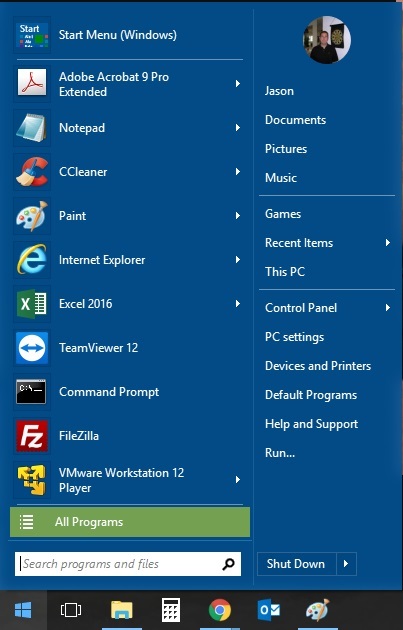 If you need to access the original Windows 8/8.1/10 style menu, simply click on the top-left item in the list, titled “Start Menu (Windows). Get the easy to use Windows 7 style Start Menu back!